The Escalante Parent Organization is hosting the Escalante 5K and Family Fun running event on April 26th. The one-mile fun run event will begin at 4:00 and the 5K will take place at 4:30 PM. Pre-race day registration is $10, and if you register before April 12th, you will receive a pre-ordered T-Shirt on race-day. Registration is $15.00 the day of the race. 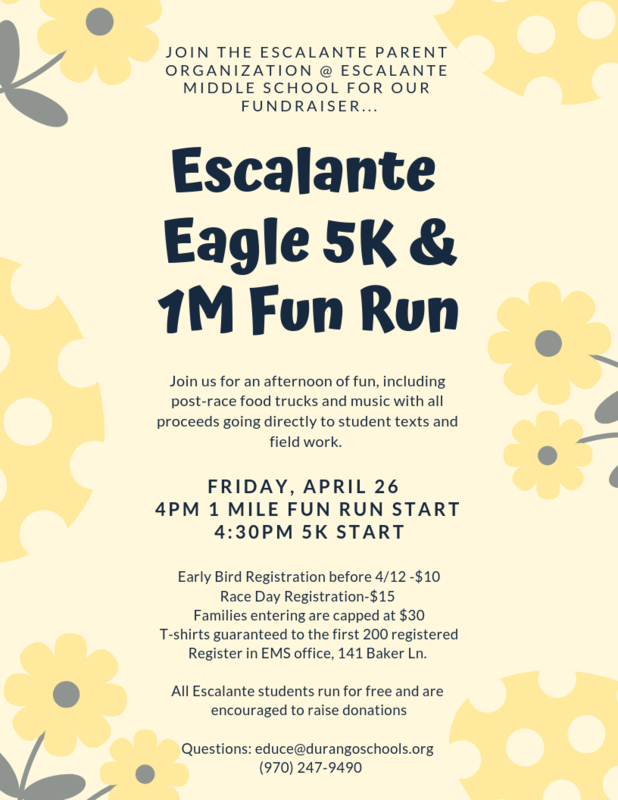 (Registration form attached below) Escalante Middle School students run free, but we are encouraging our student runners to raise any donations in the form of pledges. All proceeds will go directly to student field experience. We hope that our families come out for a Friday afternoon of fun on April 26th. We will have music, food vendors, and a terrific course. Please save that date!